Really liked this story. Always been fascinated about the IRA and enjoyed hearing a small piece of their world. 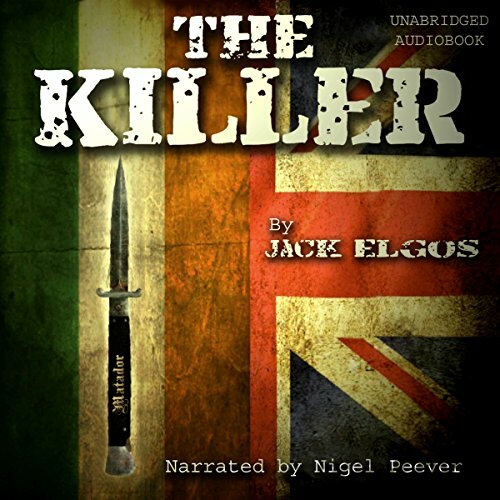 The story focuses on The Butcher of Belfast as he quickly becomes a proven killer. The story starts out fast and quickly builds up his character to the point you are rooting for him even though he isn’t a good guy. He clearly has some morals even if they are slight. This book really develops The Butcher and sets everything up for the next two books. The plot follows The Butcher as he moves around and a large part of the story takes place in Spain. That part of the story line was actually my favorite even though I was initially hoping for more story around his Belfast time. Everything in Spain is building up to an ending you won’t see coming. I have great expectations for the next two books. Nigel did a great job with the narration. His character voices were outstanding and I really enjoyed his voice for McQuillan. The energy and emotion he put into that character coupled with the giggling really creeped me out. The tension in that cell room with Darren and McQuillan was palpable and I was on the edge of my seat. Hope he continues with the next ones. the time for most listeners. The Narrator does a good job in making the story come alive. The narrator is good. The story is the start to what should be a nice series. I will continue to read the next few to see where it goes. The Killer, Book 1. The best thriller on this subject I've read in years. Set in the "troubles" of Northern Ireland in the 1970s/80s it is the story of a terrorist or is he a hero, who knows and by the end of the book I still haven't decided. Warning this book does contain strong language and some violence, it is realistic. Gripping & intriguing plot, well defined & developed characters. Great listen and keeps you listening. Narration in one word excellent. Looking forward to book 2 on audible. Lots of action, narrator is great! First of all, let me disclose: "This book was given to me for free at my request and I provided this voluntary review." Now that I've got that out of the way, let's talk about this book! Having just re-read Patriot Games by Tom Clancy, I really enjoyed reading another book about the various terrorist/military factions at play in the United Kingdom in the late 70s/early 80s. It is so fascinating to me to see how people can believe in a cause so completely as to do things that are completely depraved and feel good about it. And of course, I'm talking about both sides here! The language in the book is very harsh, and may be offensive to some readers, but it definitely is authentic. It's not overdone for shock value, it's not inaccurate for the time period and place, it seems to be very characteristic of the people and events of the novel. The narrator of the audiobook version that I am evaluating kept the book interesting. I'm not an expert on the various accents and dialects of Northern Ireland, or anywhere, for that matter, but it seems like a lot of time and effort was put into making the accents and dialects accurate for the characters. The different accents really make the story pop. This is a very promising start to a series. The tension builds several times during the novel, and especially at the end, where the stage is set for the protagonist to become a very effective tool in the trade of war and terror. I would definitely recommend this book to anyone interested in European terrorist groups of the late 20th Century, or political thrillers, or just action novels in general. Definitely worth a read. This book was very hard for me to get into. I'm not sure why but it was hard to follow and stay focused on the story line. The Butcher of Belfast! Very interesting story, really enjoyed it. It wasn't long but I thought very well written with great narration to give it that extra added touch to really bring it to life. I'm fascinated with Ireland and that period in time, and following his travels through Ireland and Spain was captivating. I'm anxious to hear more, and am awaiting more in the series! Great job! This was a great listen. The story was thrilling and engaging. The narration was also well done. The characters in the book were well developed and interesting. All in all, this was a great book and I will definitely look for more in the series. I wish I could have given a better review but since I didn’t enjoy the story. Maybe this is how it was in the “70” in Belgium and makes me glad that grew up in the USA and not in a foreign country. Really gripping book by an incredible narrator. I listened to it in just two sittings! When's the next one out? This book was recommended to me by a friend. I was not let down by the fast-paced story. There's violence, which is expected in a thriller book like this. I like the quick turns after another. The story does not stay in just once country. When I thought the story hit the climax, there is another turn. I like how it turned out in the end. Waiting for the next installation of the series. The narrator's voice is just right for thriller books like this. He reads similar to the narrator of Steve Robinson's books. The Killer, Book 1, is a good action and mystery adventure. It keeps me at the edge of my seat. I enjoyed this first book and I'm looking forward to listen to the next one. The first of the series. I find it compelling and as expected, fast-paced. Thumbs up for the narrator's performance. The story was given justice with his narration. There's few more compelling backdrops to a story than The Troubles, and the narrator did an excellent job at drawing out the drama. I'm looking forward to the next in the series. Engrossing story made more compelling by excellent narrator! Would recommend you check this book out. Narration brings out the best of The Killer. Narration brings out the best of The Killer. The narrator was able to portray all the characters well. The different accents are just perfect. This first book focuses of the The Butcher of Belfast as he quickly gains his name. There are shocking choices of words, violent scenes and even political intervention. The book is fast-paced and has made a lot of turns all throughout the book. Would recommend to all listeners of mystery and thriller books. I like the thrill of the story. I like the thrill of the story. The story does not stay in just one setting. I am not fond of stories with political entanglements but this one got me all hooked up. Really enjoyed this audiobook. I was looking for something fun and exciting to keep me company on a long car journey and this did the trick nicely. I recommend it. The narrator's voice and emotion compelled me to listen more until I finished the book. It started slow but it builds up quickly. Lots of characters involved making the book more unpredictable. Thrilling!